This was another high-scoring series and in the end the 15th-seeded ’00-’01 Colorado Avalanche outscored the 31st-seeded ’84-’85 Winnipeg Jets by just four total goals over the seven games. As the title says, Joe Sakic was the engine for the Avs in this series. He scored 10 times in the series, which was a team-high, but incredibly not a series-high. His linemate, Milan Hejduk, was second in goal scoring for Colorado with six goals. Those two players were also first and second in results, with 12 and 11 respectively. Therefore, those two both finished atop Colorado’s overall scoring leaderboard. 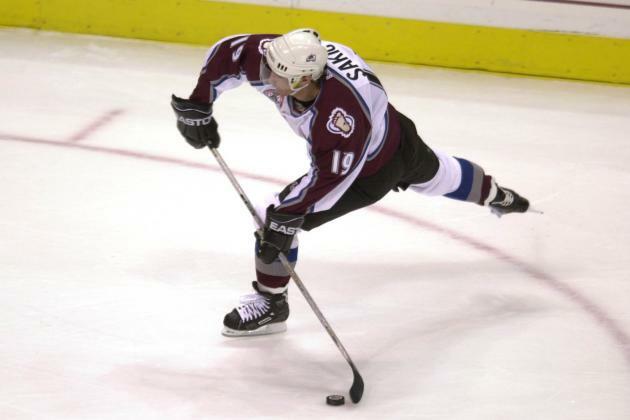 Sakic finished with 22 points, of course, while Hejduk finished with 17 points. They were also tied for the team lead in plus/minus with ratings of +9 while the third member of that forward line, Alex Tanguay, finished second with a +4 rating. Goaltending……was downright brutal in this series, for both teams. Patrick Roy was pulled twice in this series and posted terrible numbers. He posted a 4.57 goals against average to go along with a horrid .844 save percentage. The Jets have been an offensive force all tournament and that didn’t stop here. Dale Hawerchuk has been an offensive force all by himself in this series and that also didn’t stop here. He posted a series-high 11 goals in the seven games. Doug Smail was a relatively distant second for Winnipeg with six goals. Paul MacLean was the Jets’ best playmaker in the series with a team-high 11 assists as he continued what was an absolutely stellar offensive series. Hawerchuk was tied for second in helpers at eight with defenseman Randy Carlyle. It was the usual two at the top of the Jets’ overall scoring leaderboard. Hawerchuk led the way with 19 points while MacLean was second with 16. Smail posted a team-high +6 plus/minus rating while Hawerchuk and MacLean were tied right behind him with +5 ratings. I mentioned Roy’s struggles for Colorado, well it wasn’t any better for Winnipeg. Starter Brian Hayward was pulled four times during the course of the seven games and his numbers were nearly identical to Roy’s. Hayward finished the series with a 4.71 goals against average to go along with a .865 save percentage. The Avalanche franchise have made it to the Third Round in both UNP’s, but now the ’00-’01 Avalanche have become the first team in the franchises history to make it to the Quarterfinal!. In the inaugural UNP, the ’84-’85 Jets failed to make it out of the First Round. They were much more successful this time round as they made it to the Third Round before being eliminated thanks to some historic performances, in UNP play, from their top line. The ’00-’01 Avs will either face the 7th-seeded ’71-’72 New York Rangers or the 23rd-seeded ’79-’80 Buffalo Sabres in the Quarterfinal! Up next in the Third Round, the 3rd-seeded ’07-’08 Detroit Red Wings take on the 14th-seeded ’34-’35 Montreal Maroons! This entry was posted in 3rd Round, Ultimate NHL Playoff and tagged Alex Tanguay, Brian Hayward, Colorado Avalanche, Dale Hawerchuk, Doug Smail, Joe Sakic, Milan Hejduk, Patrick Roy, Paul MacLean, Peter Forsberg, Randy Carlyle, Ray Bourque, Rob Blake, Third Round, Ultimate NHL Playoff, Winnipeg Jets. Bookmark the permalink.